Gen Xtinct: Up, Up and Awaaaaay! Got $85 bucks and a jones for '70s action figures? Then you've already put in your order for the soon-to-be-released DC Universe Wave 1 World's Greatest Superheroes set, inspired by the much-loved Mego figures of Christmases past. 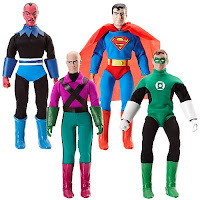 Superman, Lex Luthor, Sinestro and Green Lantern all feature designs guaranteed to rocket you back to days of yore, when action figures wore removable cloth costumes -- allowing kids to discover that Superman wasn't exactly very "super" under his red underpants, after all.